Miles to go before I sleep: Why run? A lot of people ask me why I am a runner. I guess it kills the time. The question has gained new depths since I ceased to be a runner, and became someone who trundles off for a few miles a couple of times a week. Maybe. If the weather looks good. However, I think it's worth taking a pass at an answer to the question. It takes the convergence of a number of life-threatening elements to persuade a previously mostly-sane and largely indolent man to take to the road, and to see anything less than a fifty-mile week as a recovery period. These are the answers that came to me in late November -- when I was still a runner -- as I trod softly by the Cam in the dark, along the stretch that extends from Lammasland to Grantchester, when I began to reflect on the many thousands of miles I had run since my Road-to-Damascus like conversion in 2004. Ten thousand probably. Where did they all come from? How and why did a sedentary scholar discover the pleasures of lycra and stability shoes? There were four reasons that suggested themselves to me. Two. Sean Matthews, my then colleague. He suggested we go out for a run after work. We did so. In retrospect it was not unreasonable that he should get me to run 10-11 k, but 54 minutes later I thought I had been disembowelled. He announced that he'd done the same route the preceding day in 44 minutes. He was training for the New York Marathon that year. That experience taught me that whatever I was doing before, it wasn't running. I bought a running watch. Interlude: it's the evening of the New York Marathon 2003, and I'm sitting in Bouley in Manhattan, a stunning restaurant, with my friends Sean and John Beech. Sean is being studiedly vague about his time. The sub-3 had not appeared. Only the stunning wine fed us by the then-sommelier Brad Hickey (see his blog) can cheer him. Sean and John try to convince me that I need to run marathons. It's a deucedly ridiculous notion. Three: drowning my father-in-law's Audi 6. It all really begins with my climbing out of the window of an Audi into a flash flood in central New Jersey, and lifting my youngest son from the roof (he'd climbed through the sun roof). This was in December 2003, and it was meltwater from the long-frosted snows on a nearby golf course that gave rise to the flood. The waters had caught us, killed the engine. Things looked bad when the waters started to come in through the door. We began bailing with plastic cups. We watched with alarm when my youngest dropped his, and it shot off in the floodwaters, like a racing yacht. The Audi was a write off, and so, nearly, was my back. I waded through the waist high water towards the flashing police lights ("stay in the car") they were shouting at me, but I'd had enough at that point. I'd watched a deer stare at me from the elevated woods, before stalking off, and had felt the sting of his scorn. So my youngest was fine, but when I lay on the floor back at the apartment later that evening I found it hard to get up. And then my leg started to go numb. Plenty of pain medication -- some black market demerol from a neurosurgeon friend (think childbirth painkillers) -- later I found myself having an MRI. The scan showed a problem with my spine, and threw up some strange shadows. Another, much longer scan was called for (I napped for 90 minutes in the machine -- it was quite restful). On reading the scans I was told that I was lucky I could walk. This was nothing to do with the flash-flood: instead the scan had turned up a congenital defect, hydromyelia, or water on the spine. My father in law remarked that I was luck I wasn't a poster-boy for the March of Dimes (a disabled charity in the US). The hospital asked if they could scan my brain to work out what was going on, i.e. why I seemed to be able to walk. They were a little surprised when I declined. So I left with a prescription for physiotherapy, serious physio of the kind you get with private health insurance in the US. An hour or two, twice a week. It was great. And starting to run again (I used to increase the speed on the treadmills when the physiotherapist wasn't looking) taught me how much I had missed it. In the spring of 2004, I recommenced running around the woods in Princeton, peaceful and restorative, then along the canal. It was a life-transforming experience. I was utterly hooked. Being told that you shouldn't be able to walk, being told that you're not allowed to run -- these are the ultimate motivators. Not to speak of the bucolic delights of running along the New Jersey -Delaware canal. Four. 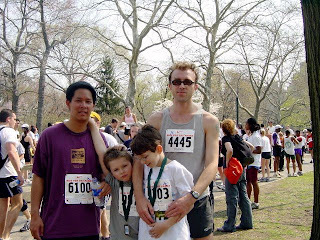 My brother in law Steve signed me up for a race, the four-mile Run for the Parks in Central Park, New York. He's a footballer rather than a runner, but he thought it might be fun. The boys did it too (see picture). It was a carnival. The weather was perfect. The crowds cheered. 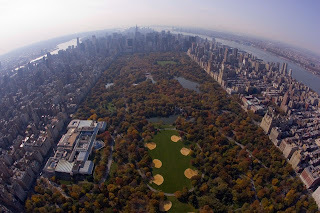 It was central park, one of the most improbably nice places on earth. It was too crowded to race, but I knew, from the moment my heart rate passed the comfortable zone, that I was instantly addicted to the drug of racing. I've never been one for parties and dancing, but if I had been, this was it. As we walked back to Steve's apartment on the upper west side New Yorkers thanked us for our support of the Parks charity. Soon after that I signed up for th e Cardiff Marathon in the Autumn of 04. And the rest is pain, blisters, bleeding, limping, obsessive record keeping, torn calves, carbo-loading, free t-shirts, worn out shoes, stretching and binge-teetotalling. I really should start doing it again.